Back in 1989, three guys (and a drum machine) from Birmingham, England united to form the seminal industrial metal outfit Godflesh. And while that band is definitely worthy of your time, they are not exactly the focus of this edition of Flashback Friday. No, I’d like to rewind a few years earlier…to a time when the term “industrial“ referred only to factories and mechanics not to a style of heavy music. The year was 1982 and bassist Ben (G.C.) Green and guitarist Paul Neville had already begun to create an aggressive blend of grindcore and sludge that was mostly unheard of at that time. The duo took the name Fall of Because after the first track off Killing Joke’s legendary 1981 album What's THIS For…!. 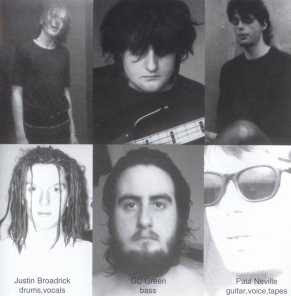 Eventually they would recruit Napalm Death guitarist Justin Broadrick to join the band as their drummer and vocalist and at that point, their lineup was set. Fall of Because recorded a demo called Extirpate in 1986 that included the songs “Mighty Trust Krusher” and “Life is Easy”, both of which would later be featured on Godflesh‘s first full length Streetcleaner and “Merciless“, which would appear on their EP of the same name. Unlike the militaristic, mechanized onslaught of that band however, Fall of Because was more organic, more abrasive…more sloppy. Their sound was a crushing, pissed off, sludgy ball of noise that predated even the likes of genre mainstays Acid Bath and Eyehategod. But not long after recording the demo, Broadrick would leave the band to focus on another interesting project, the stoner/industrial tinged Head of David. His departure was short lived however and in 1988 he contacted Green about reforming their old band. When the reunion occurred, Broadrick decided to return to the guitar (his original instrument in Napalm Death) and the drum machine was incorporated in place of an actual drummer…alas Godflesh was born. The summation of the Fall of Because era was finally compiled and released in 1999 on the album Life is Easy. Give it a listen and you can hear the ambient noises, the barking vocals and the syncopated riffing that would come to define the industrial metal of Godflesh. However, if you look deep inside the maelstrom, the distinct, lumbering heaviness that would eventually characterize sludge is lurking there within. Go on and check it out for yourself…just…because.